There’s a too-obvious parallel here, but entertain me for a moment, please. In 1992’s White Men Can’t Jump, Billy Hoyle (Woody Harrelson) arrives at Venice Beach in a tie-dyed baseball cap, hideous shirt, and ratty cargo shorts–a hustler disguised as a naif. His deception is quickly exposed. Hoyle weaponizes his whiteness by recognizing that others view him as a slow-footed geek and an outsider to Venice Beach’s sand-swept courts. There’s no greater purpose to his life beyond winning basketball games and hustling suckers for their money. Nick Ansom, like Hoyle, is white. 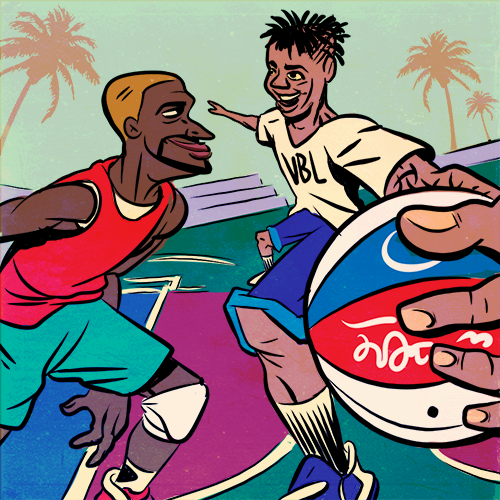 In fact, he’s Parisian–or, in basketball terms, that adds an unspoken stigma of “soft” to “slow.” He, like Hoyle, is a basketball obsessive, whose bronzed skin has been earned by countless days at the Venice Beach courts. The comparison is ultimately skin-deep. Whereas Hoyle is monomaniacal to the point of self-sabotage, Ansom’s using his love for basketball as a conduit for greater enlightenment. 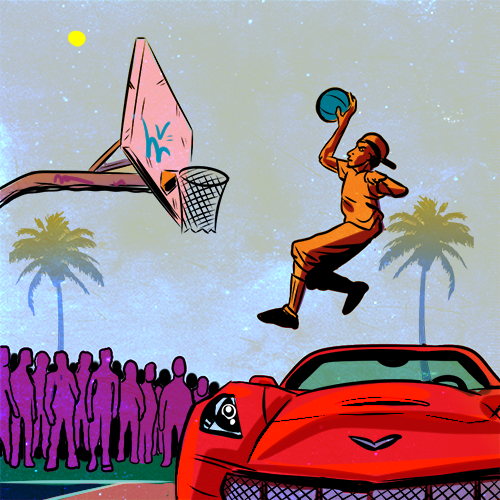 In 2006, Ansom founded the Venice Beach League, one of Los Angeles’ premier basketball leagues (and almost certainly its best outdoor competition), but he’s expressed aspirations beyond getting 10 people on the court at once. A sense of disillusionment, catalyzed by injury and the brutality of organized basketball, yielded to a Yoga-aided holistic attitude. He preaches to his young charges the benefits of Yoga, careful nutrition, and enjoyment of the game. To him, basketball is an art form worth nurturing, and a rallying point for his adopted community. I came to [the United States] when I was 13, and went to this basketball camp up in the Napa Valley, which is how I got connected on the basketball scene. I met some coaches, and they recommended Fairfax High School as one of the best places to play basketball in LA. I met with the coach [Harvey Kitani], and he really liked me. Going to Fairfax was a nice little reality check on your game; I was one of the top players in the country in France, and came here and saw what basketball culture is really like. The game is more physical, the skill level is higher. What I was lacking in skill I made up in having a European-style game: understanding teamwork, good fundamentals, and a lot of heart and passion. It was kind of culture shock, and I didn’t speak English too well back then. [They wanted me to put me in E.S.L. (English as a Second Language) courses.] It was a great experience, though. I played with Jamaal Boykin, Josh Shipp, Evan Burns–the whole team went Division I, pretty much. I went to junior college, tore my ACL, and that was another wake-up. I started DJing two nights per week in Hollywood–it was hard making money and staying up late then getting up early and going to school and practice. My brother was a house DJ in Paris; my father’s a big jazz [fan, and] we used to go to a lot of rock ‘n’ roll concerts. There was always music around me growing up. Coming here from Paris at 16, where there’s a big nightlife culture, it’s like, there was no fun parties to go to. I bought my own setup off of Craigslist and started DJing–I would throw parties in the house, and turn the house into a nightclub. I still DJ a little bit, but it’s not my calling quite yet. Being a club rap DJ, I don’t think is my identity right now. I started this website, BallInLA.com, that was sort of a guide to pickup ball in LA; it would tell you where the runs were, what days were open gym. I wanted to do a full launch for the website in 2007, so we did a tournament called The Sunshine Baller Tournament. I went to 100 parks around the city and taped some posters to backboards and told everyone I encountered along the way. We did a one-day, 12-team tournament–except 16 teams showed up that morning. We had my aunt and mother doing registration. It was complete chaos. Teams were showing up with seven-footers and pros from overseas that I’d never heard of. I thought I’d stacked my team to win it, and, soon enough, we lost in the first round. Bone Collector and Sick Wid It were there [too]. I was like ‘Wow, I’ve never had this kind of success.’ I was 20 or 21. ‘Let’s put a league together’; I always had my DJ rig in the back of my car, I’d pull it up at half-court. [Organizing the league] came a little bit from the nonsense of going to Venice and getting sucker punched–Venice has always been physical ground, but I feel like in the early days there was a little more pride to the game. As beautiful as it is down there, there’s a few guys who are there just to ruin the day. It doesn’t make it that fun when you go home all bruised up. It’s not really in my nature to fight. Referees came in to regulate–it was all volunteer-based for the first three years–and I would DJ, host, promote, and I had my own team. Teams started to form, sponsors sponsored uniforms, and it became a little more legit. The style of the VBL is fast action: highlights, hard-nosed, physical, unique. When the VBL started we had a lot of And1 players, so it was more gimmicky, but now every team that joins the league has a couple pros. 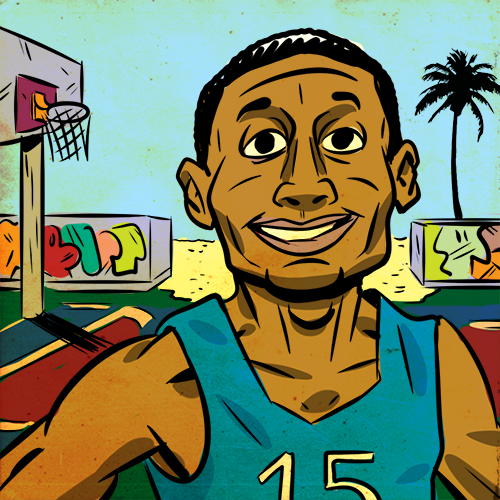 It’s more like real basketball with the fun factor of playing at the beach. Everywhere you look, there’s women in bikinis and palm trees–you can only be so tough. I’ve been to a lot of streetball tournaments, and I wouldn’t even put us in that category. I call it the “Hooper’s Paradise.” It’s very spiritual, and one of the most beautiful places you could ever play basketball in. It gives you a different perception. The people who are open-minded and truly love the game will come and play at the VBL. It’s a beautiful showcase for talent–any given day you could have 2,500 people watching. I’ve invited hundreds of pro players to come. It teaches you a little bit to be fearless–there’s always fear in the back of pros’ minds: ‘Outside? Are you crazy? Do you know who I am?’ That’s the natural reaction of players. For the ones who [play], it shows a lot about their character: it shows passion, a little bit of a fearless attitude, and I think those are the people who succeed on and off the court. One of the slogans is “Bringing fun back to the game.” You’ll actually see people playing with a smile, and the idea is to bring love and passion back to the game. College took all the fun out of the game for me. I’d go home after practice, miserable, and that’s not what basketball’s about. It’s supposed to make you feel good–it’s an art form, y’know? A place where you’re free. Even high school is so organized, systematic, and calculated. It loses its artistry. It’s a community league before everything. This year we’re talking a little more with the City of Los Angeles. Hopefully we’ll bring a couple more corporate sponsors and grow bigger every year. I have a hundred different projects I want to do around the sport; I spent a few weeks down in Belize renovating basketball courts and doing some basketball clinics. We’ve done tours to France, Mexico, Northern California; we’ve done fundraisers with the police and different non-profit organizations. I want this to be my contribution to the youth. They’re already so skilled, but with a zen attitude and the right nutrition, it’s like See how much better can you be? See how much better you feel on the court? I come from the countryside in France–a small village with a population close to 1,200 people and 1,000 cows. When I moved to Los Angeles in January 2011, I moved in Nick’s apartment. I’d been traveling back and forth between France, Canada and LA from 2011 to 2013. I’d call Nick my “brother from another mother”–we’re friends, roommates, co-workers, and people at the court call me “Nick” 50 times per day during events cause we are both French and look very similar. I got a lot of “Oh, sorry, I thought you were Nick! Are you guys related?” I’m sure 80 percent of the players think that I’m his brother. [Basketball] is in my blood. I come from a family where everyone has been involved with basketball: my grandpa used to play, my dad was a coach, trainer, referee and player, my mom played, and my sister and brother are still playing. I spent my youth going to basketball gyms every Saturday and Sunday. My dad used to coach me and my siblings–he was very involved with the basketball organisation in my city. I started to play soccer at six or seven years old like everyone does in France, but I spent all my weekends with my dad playing basketball in the gym, so I quickly gave up on soccer and played basketball. I became an assistant for the youth teams, then coached my little brother for 3 or 4 years. Between 12 and 21 it was all about basketball, I was volunteering for referring, stats keeper, coach, etc. [Venice Beach] is awesome! You have a 1000 different characters that randomly show up at every event: the Muscle Beach guys, the man playing guitar on rollerskates, the crazy beach bike with 100 speakers and 1000 lights. Venice Beach is the first chapter of the Hollywood life. During my first summer at the VBL, I didn’t know many people, nor had I spent much time in Venice, so I got the whole experience in terms of funny characters. Week by week, I got to know what Venice is really about, and I got more comfortable talking to people. I moved to LA to study English for a semester, but I realized I didn’t want to go back, so I enrolled for a second, then got a certificate in Marketing/Business development, so I had a one-year working visa that ended recently. As a European, without much pickup game experience, I was impressed by the style of play. People play hard, [and] you have guys like Metta World Peace, Terrell Owens, Keith Closs, D-League players, overseas pros, Division I players and Venice Beach streetball players. Everyone wants to put on a show! If you play against [professional league] guys you don’t want to lose. Plus, there’s the special VBL rule that if you get dunked on you have to sit for two minutes. The game stops, everyone is on the court, and Mouthpiece (our MC) makes sure to give you the most exposure you’ll ever get at the VBL. And we’ll post the video to our social media! Back in France, our game was all about drawing up the offense. We had 8-12 offenses that you learn during the pre-season, and the point guard will call different plays every time. We set up screens, pick ‘n’ roll, and we use a lot of fundamentals. The first time I played in Venice before I got into VBL, I was like, ‘Okay, so it’s all about individualism.’ I was kinda shocked by how many shots some guys take during the game–and 70 percent of them are not good decisions. Then you have guys that will take 100 shots, don’t pass the half-court line, but still yell at you to get back on defense. In the end, it was a great experience. I had lot of fun playing pick-up in LA. I’m very thankful to Nick for letting me be a part of what he’s built on his own. Thanks to the VBL, I was able to follow and expose my passion for photography using one of the best playgrounds in the world. Everyone at the court has a different background–lawyer, teacher, technician, student, [but] nobody will judge you for where you come from. Once you step on the court it’s all about your game.